Bosch GSR 18V-60 FCC battery, the drill-battery.co.uk supplies high quality Bosch GSR 18V-60 FCC cordless tool battery replacement, UK stock. Buy Bosch GSR 18V-60 FCC battery with 1 year warranty. 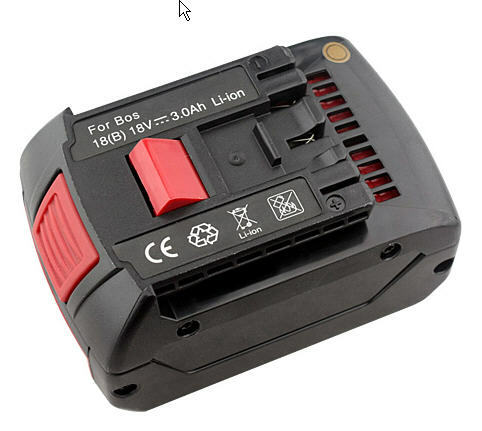 We specialize in selling Bosch GSR 18V-60 FCC battery, we are also dedicated to bring high quality Bosch GSR 18V-60 FCC replacement battery to customers at reasonable prices with best customer service. This is Bosch GSR 18V-60 FCC Replacement battery, non-original battery, can replace the following original batteries part numbers, specifications backed by full 1 year warranty guarantee and 30 days money back gurantee! Shipped fast! (Special Delivery: 1-2 days, Registered Delivery: 3-4 days). The more you buy the more you save! Please note that these are not BOSCH products. There are 5 Bosch GSR 18V-60 FCC Replacement batteries for cordless tool below. The only difference among them is the capacity, battery with larger capacity lasts longer after being fully charged, pls note. Our Bosch GSR 18V-60 FCC Replacement batteries can be charged by your original charger, don't worry about this. Please click the image for more details. Then Add to cart to order the one you selected. We will dispatch the Royal Mail within 24 hours, Monday - Friday. Bosch GSR 18V-60 FCC Replacement battery are guaranteed to meet or exceed OEM(original) specifications backed, it conforms with the exact specification of the original manufacturer and the battery is guaranteed against all manufacturing defects. All of our products are 1 year warranty guarantee and 30 days money back gurantee! Shipped fast! Please ensure this Bosch GSR 18V-60 FCC Replacement battery that you are going to buy fits the brand, model and part number of your device. Did you know? Bosch GSR 18V-60 FCC Replacement batteries have the same performance standards as OEM batteries, but are less expensive. This Bosch GSR 18V-60 FCC battery replacement has been manufactured with high quality components. It conforms with the exact specification of the original manufacturer and the battery is guaranteed against all manufacturing defects. 100% Q.C. of this Bosch GSR 18V-60 FCC battery. This GSR 18V-60 FCC cordless drill battery replacement is guaranteed to meet or exceed original specifications. This GSR 18V-60 FCC battery replacement is sell with 1 year Warranty. This Bosch GSR 18V-60 FCC battery replacement is sell with 30 Days Money Back. Welcome Wholesaler - We encourage Wholesaler purchase Bosch GSR 18V-60 FCC batteries in our site. If you want buy Bosch GSR 18V-60 FCC, please leave message.